In January 2007, Netflix brought the ability to watch a limited number of its catalog of movies and TV shows to users of Windows-based PCs—all for free, as a part of an existing Netflix subscription. This summer, the company began working with hardware companies to embed Netflix Instant Watching in set-top devices such as the Roku Netflix Player ( ). Now, at last, the company is finally rolling out support for Instant Watching to the Mac. Though the roll-out of Instant Watching to Mac users is happening gradually (a post on Netflix's blog says that the update is currently available for "a small percentage of new Netflix members"), I contacted Netflix and was able to have them add it to my account for the purposes of this article. I already own a Roku Netflix Player, and last summer I spent some time attempting—with limited success—to watch videos using Instant Watching via Windows XP in Parallels Desktop and Boot Camp. So I was excited to finally get a chance to play videos within the happy confines of my Mac’s web browser, natively. 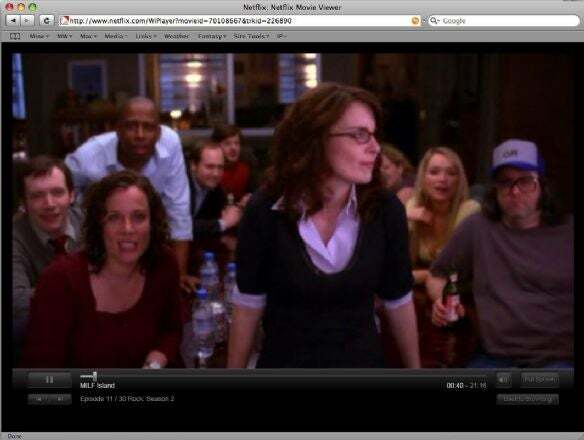 The Netflix player uses Microsoft’s Silverlight technology to play back videos. Since Silverlight only works on Intel-based Macs, Netflix Instant Watching won't work if you’re still using a PowerPC-based Mac. (Netflix says that three-quarters of its Mac customers own Intel Macs.) The video content is copy-protected via Silverlight’s built-in Play Ready DRM. The Netflix Player interface running within Safari. When I tried to use Instant Watching on Windows last year, it was a frustrating experience. I had to approve the downloading of various media keys in order to avoid an error screen that said I had no approval to play back videos. I can’t say whether that was a typical experience or one that was complicated by the fact that I was actually on a Mac running Windows in a virtual machine. What I can say is, playing back Netflix videos on my Mac using Silverlight was effortless. 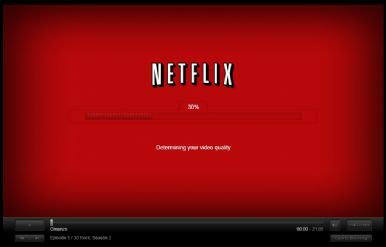 The Netflix Instant Watching progress bar. After I clicked the Play button, Safari loaded a new page with a black background and the traditional “red envelope” stylings of Netflix. A progress bar showed that the player was calibrating itself using my Internet connection, determining the bit rate that my connection could bear and adjusting the quality of my requested video accordingly. After a few seconds of buffering time, my selected video began playing without a hitch. The Netflix player window is simple, with a play/pause button, a progress bar, volume controls, and a Full Screen button, as well as a Back to Browsing button that returns to you where you were before you pressed Play. You can slide the controller on the progress bar to skip to any part of the video, which begins to play again after a brief pause for buffering. The size of the playback window is variable, too. It appears to be fixed to a minimum width of 720 pixels, but as you expand the size of your Web browser window, the video scales to fill the space. Navigation within a video, with thumbnails. As on the Roku Netflix Player, when you slide the progress bar, the Netflix Player displays a thumbnail preview of where you are within the video, with smaller thumbnail images on either side. (The thumbnails appeared on many, though not all, of the videos I tested.) It’s a useful way to quickly find a particular scene without all the bandwidth that a true fast-forward effect would have. Unlike some (usually Flash-based) Web video players, the Netflix Player didn’t drop frames in full-screen mode. However, I found that full-screen mode occasionally didn’t work properly—sometimes I would only see a still image. And on my two-monitor Mac, I couldn't get full-screen mode to use my secondary display. There are still a few bugs in the service. Beyond full-screen mode, there are some other quirks that Netflix still needs to work out of the service. On several videos—mostly TV series from the BBC—I was confronted with a “Media Initialization Error 8051” rather than an actual video. It’s probably part of the growing pains of the new service. There’s no doubt about it: the biggest failing of the Netflix Player is not the fault of Roku, but of Netflix. Despite the company’s claim of 10,000 titles ready for instant watching, the catalog is filled with old movies, documentaries, some independent films, and TV shows. Of the 110 movies in my current Netflix queue, only 10 of them are available for Instant Watching. What that means is that if you’re expecting to use Netflix Player as a way to see the latest and greatest new releases, you’ll be disappointed. Netflix’s batting average is better—now 18 movies out of the 123 in my DVD queue are also available for Instant Watching. What's more, Netflix has improved the quality of movies and TV shows available for Instant Watching, most recently by adding a raft of recent Hollywood releases through a partnership with Starz.